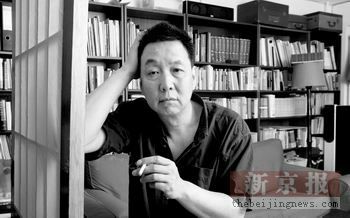 Born in 1956, Xu Xing (徐星) is a Beijing-based writer and also an occasional blogger. Xu’s latest book “Et tout le reste est pour toi” “And everything else is for you” was published by L’Olivier in France in 2005. “Refreshing,” “sarcastic,” “humorous,” and “existentialist” are some ways his readers describe his work. Many first-time travelers to China are very surprised: the country is not as poor as they thought, and people have smiles on their faces. Those foreigners conclude that Chinese people have contented and wonderful lives. But those who only come to China one or two times cannot understand, this is indicative of Chinese people’s attitude towards life and their tenacious strength for survival. I could not imagine that an unemployed worker in the West who cannot feed his family could go to a park every morning with his bird cages, or that a laid-off female worker would go into the streets to dance each night. According to my limited understanding of Westerners, their psychological or physical ability to tolerate [life’s miseries] is way way below that of the Chinese. Of course if you want to call this the optimistic nature of the Chinese, I am not going to argue with you. For example, a street vendor who sells roasted sweet potatoes was beaten up by “Urban Management” officials and with his face still swollen, he could immediately try out his English on a passing Westerner, putting on his charming smile, and saying: “Halloo, Nihao, Welcume, Chaina …” And this Westerner will conclude that Chinese people’s lives are full of sunshine. I have seen too many of this type of event. I know that my ability is limited. My camera lens could not really reach the essence of his emotion. I could only think, does he have a wife? When he comes back home, will his wife ask him where his tricycle and his stove for roasting sweet potatoes went? And where did the money he made today go? What’s on the dinner table for his family? Will his wife ask him how did he get those scars on his face?